Life with Giggles: Misadventures of a Newlywed giveaway! It is giveaway number 2 of my one year blogging anniversary month! Remember you can still enter the first giveaway here. This giveaway comes courtesy of The Monogram Divas. 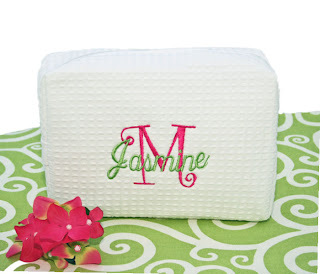 She is offering monogram cosmetic bags to two readers! Giveaway runs through Tuesday July 14th at noon EST. My favorite cosmetic product is blush! These bags are so cute!